· Grouping the regions of the EU-15 and the new member states (NMS, including Bulgaria and Romania) into five clusters according to the relative importance of broad sectors of activity reveals marked differences in the regional economic structure and development. · In capital cities throughout the EU, GDP per head is significantly higher than in other regions. Regional disparities in GDP per head have widened markedly in the NMS in recent years, though not in the EU-15. · There is no close association across regions between GDP per head and the employment rate, though the capital cities have higher employment than the national average in all countries, while the lowest employment rates are in the basic service regions in both the NMS and the EU-15. The highest employment rate in Poland and Romania is in the agricultural regions; this reflects the large numbers unable to find work elsewhere who make a living from subsistence farming. · Over recent years, however, the employment rate in NMS agricultural regions has fallen more than in other parts; the employment rate in capital cities has fallen less than elsewhere despite the apparent substantial growth in productivity. This contrasts with recent experience in the EU-15 where employment rose in all regional groups - and more in agricultural regions (which in many cases were supported by the EU Structural Funds) than in others. · The sectoral structure of activity across regions tends to reflect variations in the education levels of their working-age populations. Agricultural regions across the EU, therefore, have the largest proportion of people with low education and the smallest proportion of those with high education. Capital cities in both the NMS and EU-15 have the largest proportion of highly educated inhabitants and the smallest proportion of low-educated inhabitants. · The extent of restructuring which still lies ahead of the NMS agricultural and basic service regions, in particular, is indicated by the fact that the share of employment in services is 17-20 percentage points below that of counterpart EU-15 regions. This difference is particularly marked in business and financial services and public services. 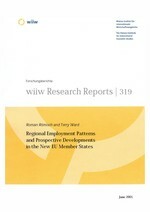 · The share of employment in agriculture declined in all NMS regional groups in the period 1998-2003. Within industry, there was a shift in employment towards the low-skill sectors in all NMS regional groups. The share of employment in services increased in all NMS regional groups, but less in the agricultural regions than in others despite the former's particular need for restructuring. · Since the share of employment in basic services in NMS regions is not much smaller than in their EU-15 counterparts, it might not increase much further in most of the NMS regions. Nevertheless, the number employed in the sector is still likely to expand significantly, if the present low level of employment overall can be increased. · Comparisons with the EU-15 show, perhaps surprisingly, that scope also seems to exist for employment growth in industry in the NMS industrial and agricultural regions. · Differences in the sectoral structure of employment across regions bear implications for the kinds of jobs on offer and the skills or education levels required. In the NMS capital cities, over 40% of those in employment in 2003 were highly skilled non-manual workers (managers, professionals and technicians) as opposed to only 25% in agricultural regions. Less skilled non-manual workers are also more in demand in the capitals than elsewhere and manual workers correspondingly less so. · In the NMS agricultural regions, almost 60% of jobs were for manual workers; in the other NMS regional groups, manual workers made up over half of those in employment, much more than in the EU-15. Low-skilled manual workers, however, account for a larger share of employment in services in all EU-15 regional groups than in NMS regions. · The occupational structure of employment shifted in favour of highly skilled non-manual workers between 1998 and 2003 in all NMS regional groups as well as in the EU-15; both groups also experienced a relative increase in low-skill non-manual jobs. This was paralleled by a decline in manual jobs, especially for unskilled workers. · Employment rates for those with tertiary education are much higher than the rates for those with lower levels; they hardly vary at all across regions and are very similar in both the NMS and EU-15 regions. This contrasts with the variation across regions in the employment rates of those with only basic schooling; they are much lower in the NMS than in the EU-15. · The employment rate of those with low education fell significantly across all NMS regional groups in the period 1998-2003. By contrast, employment rates for the low-educated in all EU-15 regions outstripped those for the better educated.